For other uses, see Memorial Day (disambiguation). "Decoration Day" redirects here. For other uses, see Decoration Day (disambiguation). Memorial Day (or Decoration Day) is a federal holiday in the United States for remembering and honoring persons who have died while serving in the United States Armed Forces. The holiday, which is currently observed every year on the last Monday of May, was most recently held on May 28, 2018. Memorial Day was previously observed on May 30 from 1868 to 1970. The gravestones at Arlington National Cemetery are decorated by U.S. flags on Memorial Day weekend in 2008. Memorial Day is considered the unofficial start of the summer vacation season in the United States, while Labor Day marks its end on the first Monday of September. In Canada, Victoria Day is a public holiday observed on a Monday one week before Memorial Day and similarly indicates the start of summer. Many people visit cemeteries and memorials on Memorial Day, particularly to honor those who died in military service. Many volunteers place an American flag on each grave in national cemeteries. Two other days celebrate those who serve or have served in the U.S. military: Veterans Day, which celebrates the service of all U.S. military veterans; and Armed Forces Day, a minor U.S. remembrance celebrated earlier in May, specifically honoring those currently serving in the U.S. military. The history of Memorial Day in the United States is so controversial that it constitutes an area of research. At Columbus [Georgia] State University there is a Center for Memorial Day Research. It, together with the University of Mississippi's Center for Civil War Research, are excellent starting points for investigating the topic. The practice of decorating soldiers' graves with flowers is an ancient custom. Soldiers' graves were decorated in the U.S. before and during the American Civil War. Some believe that an annual cemetery decoration practice began before the American Civil War and thus may reflect the real origin of the "memorial day" idea. Annual Decoration Days for particular cemeteries are still held on a Sunday in late spring or early summer in some rural areas of the American South, notably in the mountain areas. In cases involving a family graveyard where remote ancestors, as well as those who died more recently, are buried, this may take on the character of an extended family reunion to which some people travel hundreds of miles. People gather, put flowers on graves, and renew contacts with relatives and others. There often is a religious service and a picnic-like "dinner on the grounds", the traditional term for a potluck meal at a church. On June 3, 1861, Warrenton, Virginia, was the location of the first Civil War soldier's grave ever to be decorated, according to a Richmond Times-Dispatch newspaper article in 1906. In 1862, women in Savannah, Georgia decorated Confederate soldiers' graves according to the Savannah Republican. The 1863 cemetery dedication at Gettysburg, Pennsylvania, was a ceremony of commemoration at the graves of dead soldiers. Some have therefore claimed that Lincoln was the founder of Memorial Day. On July 4, 1864, ladies decorated soldiers' graves according to local historians in Boalsburg, Pennsylvania, yet the principal grave they claim to have decorated was of a man who was not dead yet. Nonetheless, Boalsburg promotes itself as the birthplace of Memorial Day. In April 1865, following President Abraham Lincoln's assassination, commemorations were widespread. The more than 600,000 soldiers of both sides who died in the Civil War meant that burial and memorialization took on new cultural significance. Under the leadership of women during the war, an increasingly formal practice of decorating graves had taken shape. In 1865, the federal government began creating national military cemeteries for the Union war dead. On May 1, 1865, in Charleston, South Carolina, recently freed African-Americans held a parade of 10,000 people to honor 257 dead Union Soldiers, whose remains they had reburied from a mass grave in a Confederate prison camp. Historian David W. Blight cites contemporary news reports of this incident in the Charleston Daily Courier and the New-York Tribune. Although Blight claimed that "African Americans invented Memorial Day in Charleston, South Carolina", in 2012, Blight stated that he "has no evidence" that the event in Charleston inspired the establishment of Memorial Day across the country. Accordingly, investigators for Time Magazine, LiveScience, RealClearLife and Snopes have called this conclusion into question. 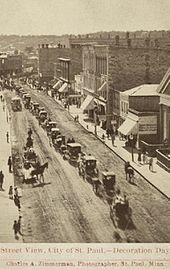 In 1868, copying the Southern annual observance of the previous three years, General John A. Logan of the Grand Army of the Republic, an organization of Union veterans founded in Decatur, Illinois, established Decoration Day as a time for the nation to decorate the graves of the Union war dead with flowers. By the 20th century, various Union and Confederate memorial traditions, celebrated on different days, merged, and Memorial Day eventually extended to honor all Americans who died while in the military service. 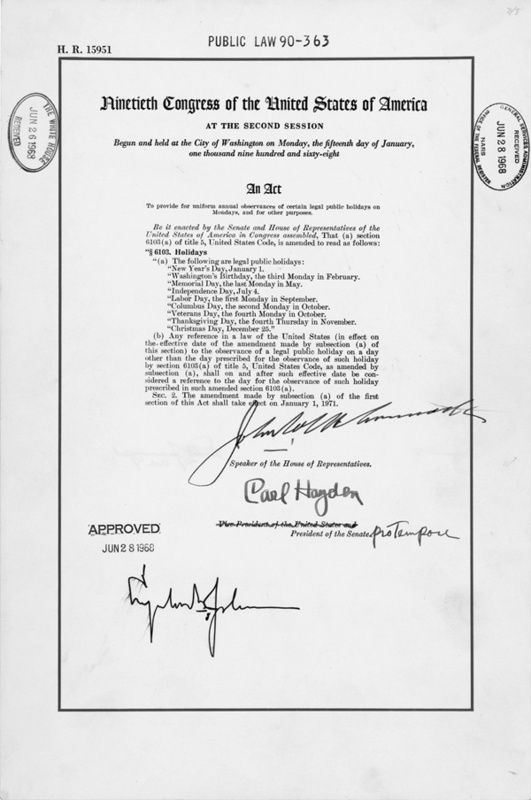 On May 26, 1966, President Lyndon B. Johnson designated an "official" birthplace of the holiday by signing the presidential proclamation naming Waterloo, New York, as the holder of the title. This action followed House Concurrent Resolution 587, in which the 89th Congress had officially recognized that the patriotic tradition of observing Memorial Day had begun one hundred years prior in Waterloo, New York. The village credits druggist Henry C. Welles and county clerk John B. Murray as the founders of the holiday. Scholars have determined that the Waterloo account is a myth. Snopes and Live Science also discredit the Waterloo account. On May 5, 1868, General John A. Logan issued a proclamation calling for "Decoration Day" to be observed annually and nationwide; he was commander-in-chief of the Grand Army of the Republic (GAR), an organization of and for Union Civil War veterans. With his proclamation, Logan adopted the Memorial Day practice that had begun in the Southern states three years earlier. The first Northern Memorial Day was observed on May 30, 1868. One author claims that the date was chosen because it was not the anniversary of any particular battle. According to a White House address in 2010, the date was chosen as the optimal date for flowers to be in bloom in the North. The northern states quickly adopted the holiday. In 1868, memorial events were held in 183 cemeteries in 27 states, and 336 in 1869. In 1871, Michigan made "Decoration Day" an official state holiday and by 1890, every northern state had followed suit. There was no standard program for the ceremonies, but they were typically sponsored by the Women's Relief Corps, the women's auxiliary of the Grand Army of the Republic (GAR), which had 100,000 members. By 1870, the remains of nearly 300,000 Union dead had been reinterred in 73 national cemeteries, located near major battlefields and thus mainly in the South. The most famous are Gettysburg National Cemetery in Pennsylvania and Arlington National Cemetery, near Washington, D.C.
Memorial Day speeches became an occasion for veterans, politicians, and ministers to commemorate the Civil War and, at first, to rehash the "atrocities" of the enemy. They mixed religion and celebratory nationalism for the people to make sense of their history in terms of sacrifice for a better nation. 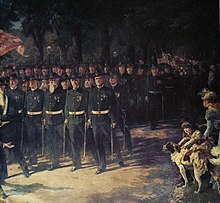 People of all religious beliefs joined together and the point was often made that the German and Irish soldiers had become true Americans in the "baptism of blood" on the battlefield. Since 1868 Doylestown, Pennsylvania, has held annual Memorial Day parades which it claims to be the nation's oldest continuously running. However, the Memorial Day parade in Rochester, Wisconsin, predates Doylestown's by one year. on the day itself, the post assembled and marched to the local cemetery to decorate the graves of the fallen, an enterprise meticulously organized months in advance to assure that none were missed. Finally came a simple and subdued graveyard service involving prayers, short patriotic speeches, and music ... and at the end perhaps a rifle salute. The U.S. National Park Service and numerous scholars attribute the beginning of a Memorial Day practice in the South to the ladies of Columbus, Georgia. On April 25, 1866, women in Columbus, Mississippi laid flowers on the graves of both the Union and Confederate dead in the city's Friendship Cemetery, claiming to be the first "Decoration Day". The early southern Memorial Day celebrations were simple, somber occasions for veterans and their families to honor the dead and tend to local cemeteries. Historians acknowledge the Ladies Memorial Association played a key role in these rituals of preservation of Confederate "memory". Various dates ranging from April 25 to mid-June were adopted in different Southern states. Across the South, associations were founded, many by women, to establish and care for permanent cemeteries for the Confederate dead, organize commemorative ceremonies, and sponsor appropriate monuments as a permanent way of remembering the Confederate dead. The most important of these was the United Daughters of the Confederacy, which grew from 17,000 members in 1900 to nearly 100,000 women by World War I. They were "strikingly successful at raising money to build Confederate monuments, lobbying legislatures and Congress for the reburial of Confederate dead, and working to shape the content of history textbooks." In 1868, some southerners appended the label "Confederate" to what they originally called "Memorial Day" after northerners co-opted the holiday. The tradition of observances were linked to the South, they served as the prototype for the national day of memory embraced by the nation in 1868. By 1890, there was a shift from the emphasis on honoring specific soldiers to a public commemoration of the Confederate south. Changes in the ceremony's hymns and speeches reflect an evolution of the ritual into a symbol of cultural renewal and conservatism in the South. By 1913, David Blight argues, the theme of American nationalism shared equal time with the Confederate. Starting in 1868, the ceremonies and Memorial Day address at Gettysburg National Park became nationally known. In July 1913, veterans of the United States and Confederate armies gathered in Gettysburg to commemorate the fifty-year anniversary of the Civil War's bloodiest and most famous battle. Since the cemetery dedication at Gettysburg occurred on November 19, that day (or the closest weekend) has been designated as their own local memorial day that is referred to as Remembrance Day. Indiana from the 1860s to the 1920s saw numerous debates on how to expand the celebration. It was a favorite lobbying activity of the Grand Army of the Republic (GAR). An 1884 GAR handbook explained that Memorial Day was "the day of all days in the G.A.R. Calendar" in terms of mobilizing public support for pensions. It advised family members to "exercise great care" in keeping the veterans sober. As the years went by, the GAR complained more and more about the younger generation. In 1913, one Hoosier veteran complained that younger people born since the war had a "tendency ... to forget the purpose of Memorial Day and make it a day for games, races and revelry, instead of a day of memory and tears". Indeed, in 1911 the scheduling of the Indianapolis Motor Speedway car race was vehemently opposed by the increasingly elderly GAR. The state legislature in 1923 rejected the race on that special day. But the new American Legion and local officials wanted the big race to continue, so Governor Warren McCray vetoed the bill and the race went on. In the national capital in 1913 the four-day "Blue-Gray Reunion" featured parades, re-enactments, and speeches from a host of dignitaries, including President Woodrow Wilson, the first Southerner elected to the White House since the War. James Heflin of Alabama gave the main address. Heflin was a noted orator; his choice as Memorial Day speaker was criticized, as he was opposed for his support of segregation; however, his speech was moderate in tone and stressed national unity and goodwill, gaining him praise from newspapers. One of the longest-standing traditions is the running of the Indianapolis 500, an auto race which has been held in conjunction with Memorial Day since 1911. Originally it was held on Memorial Day itself, and since 1974 it runs on the Sunday preceding the Memorial Day holiday. Since 1961 NASCAR's Coca-Cola 600 has been held during Memorial Day weekend, and has also been held on the previous Sunday since 1974. Since 1976 The Memorial Tournament golf event has been held on or close to the Memorial Day weekend. The Final of the NCAA Division I Men's Lacrosse Championship has been held on Memorial Day since 1986. "On Decoration Day" Political cartoon c. 1900 by John T. McCutcheon. Caption: "You bet I'm goin' to be a soldier, too, like my Uncle David, when I grow up." The preferred name for the holiday gradually changed from "Decoration Day" to "Memorial Day", which was first used in 1882. Memorial Day did not become the more common name until after World War II, and was not declared the official name by Federal law until 1967. On June 28, 1968, Congress passed the Uniform Monday Holiday Act, which moved four holidays, including Memorial Day, from their traditional dates to a specified Monday in order to create a convenient three-day weekend. The change moved Memorial Day from its traditional May 30 date to the last Monday in May. The law took effect at the federal level in 1971. After some initial confusion and unwillingness to comply, all 50 states adopted Congress' change of date within a few years. Changing the date merely to create three-day weekends has undermined the very meaning of the day. No doubt, this has contributed a lot to the general public's nonchalant observance of Memorial Day. In 2000, Congress passed the National Moment of Remembrance Act, asking people to stop and remember at 3:00 PM. On Memorial Day, the flag of the United States is raised briskly to the top of the staff and then solemnly lowered to the half-staff position, where it remains only until noon. It is then raised to full-staff for the remainder of the day. 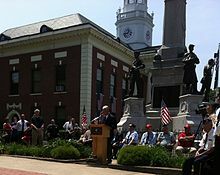 Memorial Day observances in small New England towns are often marked by dedications and remarks by veterans and politicians. The National Memorial Day Concert takes place on the west lawn of the United States Capitol. The concert is broadcast on PBS and NPR. Music is performed, and respect is paid to the men and women who gave their lives for their country. Across the United States, the central event is attending one of the thousands of parades held on Memorial Day in large and small cities. Most of these feature marching bands and an overall military theme with the Active Duty, Reserve, National Guard and Veteran service members participating along with military vehicles from various wars. In 1915, following the Second Battle of Ypres, Lieutenant Colonel John McCrae, a physician with the Canadian Expeditionary Force, wrote the poem, "In Flanders Fields". Its opening lines refer to the fields of poppies that grew among the soldiers' graves in Flanders. In 1918, inspired by the poem, YWCA worker Moina Michael attended a YWCA Overseas War Secretaries' conference wearing a silk poppy pinned to her coat and distributed over two dozen more to others present. In 1920, the National American Legion adopted it as their official symbol of remembrance. Scholars, following the lead of sociologist Robert Bellah, often make the argument that the United States has a secular "civil religion" – one with no association with any religious denomination or viewpoint – that has incorporated Memorial Day as a sacred event. With the Civil War, a new theme of death, sacrifice and rebirth enters the civil religion. Memorial Day gave ritual expression to these themes, integrating the local community into a sense of nationalism. The American civil religion, in contrast to that of France, was never anticlerical or militantly secular; in contrast to Britain, it was not tied to a specific denomination, such as the Church of England. The Americans borrowed from different religious traditions so that the average American saw no conflict between the two, and deep levels of personal motivation were aligned with attaining national goals. Memorial Day has been called a "modern cult of the dead". It shares religious themes of sacrifice while uniting citizens of various faiths. Memorial Day (2012) is a war film starring James Cromwell, Jonathan Bennett, and John Cromwell. Charles Ives's symphonic poem Decoration Day depicted the holiday as he experienced it in his childhood, with his father's band leading the way to the town cemetery, the playing of "Taps" on a trumpet, and a livelier march tune on the way back to the town. It is frequently played with three other Ives works based on holidays, as the second movement of A Symphony: New England Holidays. Veterans Day, November 11, in memory of American military deaths during World War I. Not a public holiday in the United States. See Remembrance Day for similar observances in Canada, the United Kingdom, and other Commonwealth nations. ^ a b "Memorial Day". United States Department of Veterans Affairs. Archived from the original on May 27, 2010. Retrieved May 28, 2010. ^ Yan, Holly. "Memorial Day 2016: What you need to know". CNN. Retrieved May 31, 2016. ^ Kickler, Sarah (May 28, 2012). "Memorial Day vs. Veterans Day". baltimoresun.com. Retrieved April 7, 2014. ^ "The Center for Civil War Research". www.civilwarcenter.olemiss.edu. ^ Mary L'Hommedieu Gardiner (1842). "The Ladies Garland". J. Libby. p. 296. Retrieved May 31, 2014. ^ In 1817, for example, a writer in the Analectic Magazine of Philadelphia urged the decoration of patriot's graves. E.J., "The Soldier's Grave," in The Analectic Magazine (1817), Vol. 10, 264. ^ a b c Alan Jabbour; Karen Singer Jabbour (May 31, 2010). Decoration Day in the Mountains: Traditions of Cemetery Decoration in the Southern Appalachians. Univ of North Carolina Press. p. 125. ISBN 978-0-8078-3397-1. Retrieved May 28, 2012. ^ "Times-Dispatch, 1906". Perseus.tufts.edu. July 15, 1906. Retrieved April 7, 2014. ^ ""A Beautiful Tribute", July 21, 1862". .uttyler.edu. Retrieved May 28, 2012. ^ "Sophie Keller Hall, in The Story of Our Regiment: A History of the 148th Pennsylvania Vols., ed. J. W. Muffly (Des Moines: The Kenyon Printing & Mfg. Co., 1904), quoted in editor's note, p. 45". Civilwarcenter.olemiss.edu. Retrieved May 28, 2012. ^ "Grave of Dr. Reuben Hunter". findagrave.com. ^ "Boalsburg.com". Boalsburg.com. March 26, 1997. Retrieved May 28, 2012. ^ Joan Waugh; Gary W. Gallagher (June 1, 2009). Wars Within a War: Controversy and Conflict Over the American Civil War. Univ of North Carolina Press. p. 187. ISBN 978-0-8078-3275-2. ^ Blight, David W. "Lecture: To Appomattox and Beyond: The End of the War and a Search for Meanings, Overview". Oyc.yale.edu. Retrieved May 31, 2014. Professor Blight closes his lecture with a description of the first Memorial Day, celebrated by African Americans in Charleston, SC 1865. ^ David Blight, cited by Campbell Robertson, "Birthplace of Memorial Day? That Depends Where You're From," New York Times, May 28, 2012 – Blight quote from 2nd web page: "He has called that the first Memorial Day, as it predated most of the other contenders, though he said he has no evidence that it led to General Logan's call for a national holiday." ^ a b "Lots of Places Claim to Be the Birthplace of Memorial Day. Here's the Truth, According to an Expert". Time. ^ "The True Story Behind the 1st Memorial Day". livescience.com. ^ "Who Was the Original Inspiration Behind Memorial Day?". realclearlife.com. May 28, 2018. ^ "The Origins of Memorial Day". snopes.com. ^ Halstead, Marilyn. "Did Logan start Memorial Day? Logan museum director invites visitors to decide". thesouthern.com. ^ "The forgotten history of Memorial Day - WTOP". wtop.com. May 25, 2018. ^ Affairs, Office of Public and Intergovernmental. "Memorial Day History – Office of Public Affairs". va.gov. Archived from the original on January 16, 2016. ^ Johnson, Lyndon. "Presidential Proclamation 3727". Retrieved May 27, 2013. ^ The True Story Behind the First Memorial Day livescience.com, n.d.
^ General John Logan, quoted by his wife. Books.google.com. 1913. Retrieved April 7, 2014. ^ "Memorial Day's Roots Traced To Georgia" Michael Jones, Northwest Herald, May 23, 2015. ^ Hennig Cohen; Tristram Potter Coffin (1991). The Folklore of American holidays. Gale Research. p. 215. ISBN 9780810376021. ^ "Barack Obama, Weekly Address, May 29, 2010, transcript". Whitehouse.gov. May 29, 2010. Archived from the original on April 24, 2014. Retrieved April 7, 2014. ^ "Interments in Department of Veterans Affairs (VA) National Cemeteries" (PDF). Washington, DC: National Cemetery Administration – Department of Veterans Affairs VA-NCA-IS-1. January 2011. After the Civil War, search and recovery teams visited hundreds of battlefields, churchyards, plantations and other locations seeking wartime interments that were made in haste. By 1870, the remains of nearly 300,000 Civil War dead were reinterred in 73 national cemeteries. ^ Samito, Christian G. (2009). Becoming American Under Fire: Irish Americans, African Americans, and the Politics of Citizenship During the Civil War Era. Cornell University Press. p. 126. ISBN 978-0-8014-4846-1. Retrieved May 25, 2014. ^ aaron.knapp@journaltimes.com, AARON KNAPP. "Rochester commemorates fallen soldiers in 150th Memorial Day parade". Journal Times. Retrieved June 1, 2017. ^ says, Lisa. "Doylestown Hosts Oldest Memorial Day Parade In The Country". Retrieved June 1, 2017. ^ Stuart McConnell, Glorious Contentment: The Grand Army of the Republic, 1865-1900 (1997) p 184. ^ Daniel Bellware and Richard Gardiner, The Genesis of the Memorial Day Holiday in America (Columbus State University, 2014). ^ Michael Kammen (Pulitzer Prize Winner), Mystic Chords of Memory, New York, Knopf 1991, 103. ^ Tom English, "A Complicated Journey," The Southern Illinoisian, May 22, 2015. ^ Mrs. Logan's Memoirs, p. 246. Books.google.com. 1913. Retrieved April 7, 2014. ^ "Birthplace of Memorial Day? That Depends Where You're From". The New York Times. May 27, 2012. ^ "Friendship Cemetery - Columbus MS". visitcolumbusms.org. ^ "Did You Know? Little known Mississippi Facts". US Genealogy Network. Archived from the original on May 31, 2010. Retrieved May 28, 2010. ^ a b University of Michigan; EBSCO Publishing (Firm) (2000). America, history and life. Clio Press. p. 190. ^ Karen L. Cox (2003). Dixie's Daughters: The United Daughters of the Confederacy and the Preservation of Confederate Culture. Universbuttse Memorial Day. ISBN 9780813031330. ^ Lucian Lamar Knight, "Memorial Day: Its True History". Books.google.com. 1914. Retrieved May 28, 2012. ^ David W. Blight (2001). Race and Reunion: The Civil War in American Memory. Harvard U.P. p. 265. ISBN 9780674022096. ^ Warren Leon; Roy Rosenzweig (June 1, 1989). History Museums in the United States: A Critical Assessment. University of Illinois Press. p. 140. ISBN 978-0-252-06064-9. ^ Glenn W. LaFantasie (March 1, 2008). Gettysburg Heroes: Perfect Soldiers, Hallowed Ground. Indiana University Press. p. 46. ISBN 978-0-253-35071-8. ^ G. Allan Yeomans, "A Southern Segregationist Goes to Gettysburg," Alabama Historical Quarterly (1972) 34#3 pp 194-205. ^ Alan Wilson (October 1, 2011). Driven by Desire: The Desire Wilson Story. Veloce Publishing Ltd. p. 92. ISBN 978-1-84584-389-2. ^ Henry Perkins Goddard; Calvin Goddard Zon (2008). The Good Fight That Didn't End: Henry P. Goddard's Accounts of Civil War and Peace. Univ of South Carolina Press. p. 285. ISBN 978-1-57003-772-6. ^ Alan Axelrod (June 1, 2007). Miracle at Belleau Wood: The Birth of the Modern U.S. Marine Corps. Globe Pequot. p. 233. ISBN 978-1-59921-025-4. ^ a b "Public Law 90-363". Retrieved April 7, 2014. ^ Mechant, David (April 28, 2007). "Memorial Day History". Retrieved May 28, 2010. ^ Scott, Ryan (May 24, 2015). "Memorial Day, 3 p.m.: Don't Forget". Forbes. Retrieved June 2, 2015. ^ Peggy Post; Anna Post; Lizzie Post; Daniel Post Senning (November 15, 2011). Emily Post's Etiquette, 18. HarperCollins. p. 165. ISBN 978-0-06-210127-3. ^ Congress (October 22, 2009). United States Code, 2006, Supplement 1, January 4, 2007, to January 8, 2008. Government Printing Office. p. 39. ISBN 978-0-16-083512-4. ^ "Where did the idea to sell poppies come from?". BBC News. November 10, 2006. Retrieved February 18, 2009. ^ William H. Swatos; Peter Kivisto (1998). Encyclopedia of Religion and Society. Rowman Altamira. pp. 49–50. ISBN 978-0-7619-8956-1. ^ Marcela Cristi (2001). From Civil to Political Religion: The Intersection of Culture, Religion and Politics. Wilfrid Laurier U.P. pp. 48–53. ISBN 978-0-88920-368-6. ^ William M. Epstein (2002). American Policy Making: Welfare As Ritual. Rowman & Littlefield. p. 99. ISBN 978-0-7425-1733-2. ^ Corwin E. Smidt; Lyman A. Kellstedt; James L. Guth (2009). The Oxford Handbook of Religion and American Politics. Oxford Handbooks Online. pp. 142–43. ISBN 978-0-19-532652-9. ^ Robert N. Bellah, "Civil Religion in America", Daedalus 1967 96(1): 1–21. ^ Cherry, Conrad (February 1, 2014). God's New Israel. ISBN 978-0-8078-6658-0. ^ Finch, Francis (1867). "Blue and the Gray". civilwarhome. ^ Anania, Michael (1994). "Memorial Day". PoetryFoundation. ^ Longfellow, Henry Wadsworth. "Memorial Day". The Atlantic. Bellware, Daniel, and Richard Gardiner, The Genesis of the Memorial Day Holiday in America (Columbus State University, 2014). Robert Haven Schauffler (1911). Memorial Day: Its Celebration, Spirit, and Significance as Related in Prose and Verse, with a Non-sectional Anthology of the Civil W. BiblioBazaar reprint 2010. 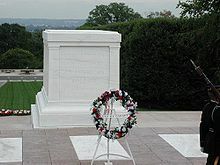 Wikimedia Commons has media related to Memorial Day. Look up Memorial Day in Wiktionary, the free dictionary. Wikisource has the text of the 1911 Encyclopædia Britannica article Memorial Day.